Stakeholders entities can be modified in the Expert view using the options mentioned below. 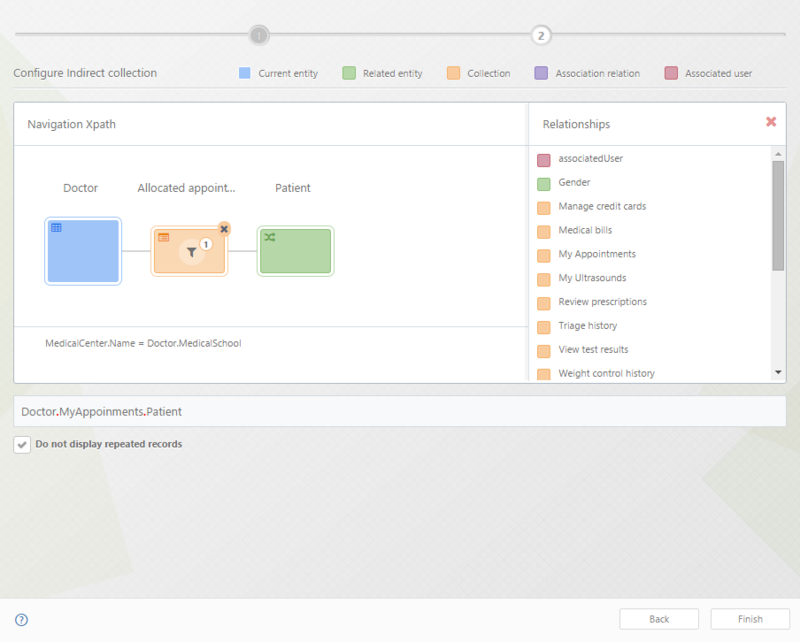 Bear in mind that these entities can be created and configured from the Experience design view. To learn more about Experience design follow this link. Some options are shown right-clicking a Stakeholder entity, or some others selecting one of the nodes of the Stakeholder entity. This is the same wizard to create and modify entities as the one used in the second step of the process wizard (Model Data). This allows to edit the display name of the entity and its attributes. The name can be modified but you must also change its corresponding dependencies. Learn more about creating an entity following this link. •Display Form: Is the form used to display the information of the entity when managing it in the Work Portal using the Admin > Stakeholders option. The controls added to the form will become columns of the table in the Work Portal. Learn more about the administration of Stakeholders following this link. •Add Form: Is the form used to add a new Stakeholder, when managing it in the Work Portal using the Admin > Stakeholders option. The controls added to the form will always be accompanied by a Search control linked to the users entity. This search can not be removed since is the Control used to specify the users bond as a Stakeholder. • Edit Form: Is the form used to edit a Stakeholder, when managing it in the Work Portal using the Admin > Stakeholders option. The controls added to the form will always be accompanied by a Search control linked to the users entity. This search can not be removed since is the Control used to specify the users bond as a Stakeholder. The user can be changed and since all the history is linked to the Stakeholder, not the user, the related user will always be the user selected (not the former one). Enables the possibility to register operations to Bizagi log. Learn more about Bizagi log following this link. Allows the addition of Business keys for this entity. Learn more about Business keys following this link. Allows you to select the parent of the selected entity. Learn more about Inheritance following this link. This list allows the automatic injection of data from the current entity, in other words, allows the values of this entity to be automatically used in actions and forms. This list has every foreign key stored as an attribute in this entity, that is to say, every entity which has a collection of items of this entity. To enable the injection of data from this entity based on a relationship, check the Automapped option. 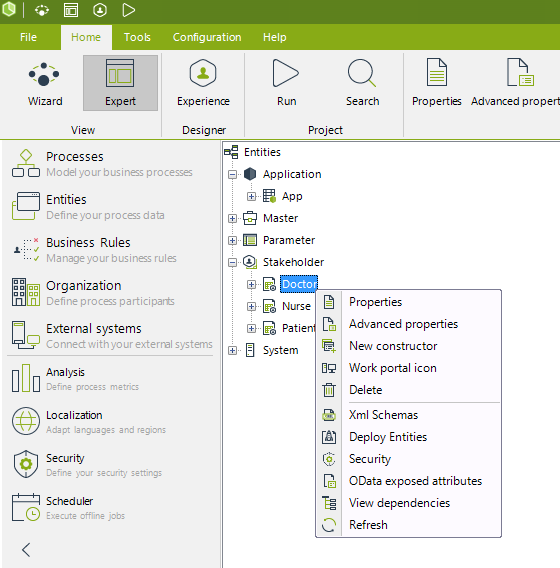 The way to create new registries in the entity directly from the Work Portal is configured during this wizard. Learn more about entity constructors following this link. By default, every Entity Action displays a briefcase icon, you can change this icon using this option selecting one of the Bizagi Icons. The icon is shown in every Action shown in the Me Menu > My Stuff. Learn more about Entity Actions following this link. Learn more about the Me Menu following this link. Deletes the entity. This can only be done if the entity is not related in any way with other elements within the project. This option is used to generate the schema used by third party services to manipulate Bizagi Web Services endpoints. Learn more about XML schema in Bizagi following this link. This option is used to configure the security of the element. Learn more about OData attributes following this link. This option is used to verify if the entity is being used by any other form, rule, entity, or element; this option lists in a hierarchical way all the dependencies of the entity. Refresh the information of the entity. Useful when working in a collaborative environment. The Attributes node contains all the attributes of the entity filtered by data type. The data types considered as attributes are the common types (Boolean, currency, date time, file, string...) and one-to-one relationships with other entities. Each attribute has a name, a display name (which is the one used in the Work Portal) and its data type. When the data type is Entity, a Related entity is shown. Lastly, the Dpl column shows if the attribute is considered in deployment. •Edit attributes: This option will display the Entity edition wizard in its second step. Allowing the user to modify, add or even delete attributes and relations, and their advanced properties. 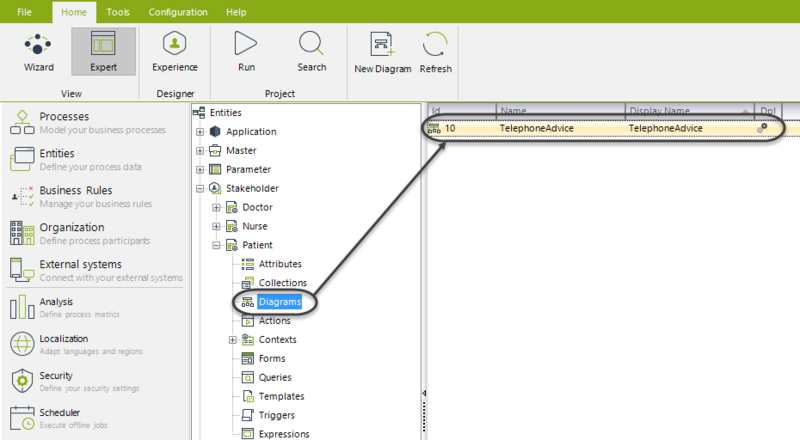 •New relationship: This option will add the specified relationship between the entities selected. The entities does not have to be related with the current Stakeholder. •Refresh: This option will reload the information stored from the database, refreshing the attributes listed. The Collections node contains all the one-to-multiple relationships of the entity. Each collection has a name, a display name (which is the one used in the Work Portal) and its related entity. The Display in Me check allows the entity to be displayed in the My Stuff menu. To learn more about the My Stuff menu follow this link. If a collection has been marked with the "Enable Add Button" option, then an option to add registries will be shown at the top of the results of a search or the values in Me Menu > My Stuff. 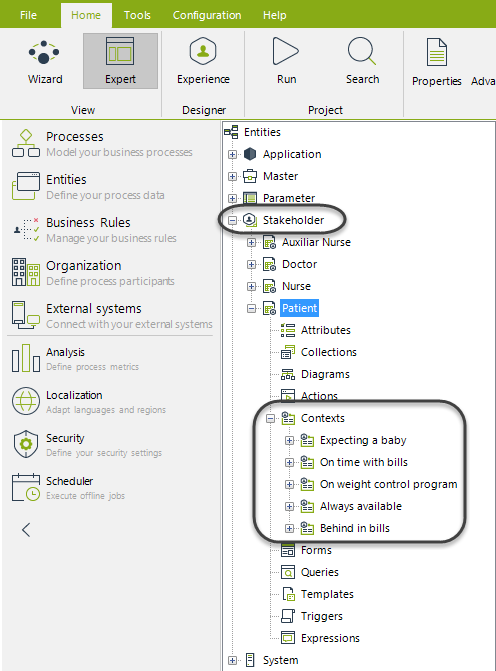 •New relationship: This option will add the specified relationship between the entities selected. The entities does not have to be related with the current entity. •New indirect collection: this option will create an indirect relationship for the current entity. Indirect relationships are Xpaths which are not directly navigable but the entity is somewhat related to the current entity. When selected, a wizard will help to connect the current entity with the target entity. Bear in mind that every collection used through the indirect Xpath can be filtered. The relationships shown at the right frame are the available relationships to navigate from the last entity added to the new indirect path. Once the relation has been specified, the new relationship will be shown amongst the other relations. Please note that the icon of the indirect relationship is different to the other relationships. •Refresh: This option will reload the information stored from the database, refreshing the collections listed. The Diagrams node contains all the diagrams modeled for this entity. There is no limitation on how many diagrams can be created under a node. The diagram does not have to have the entity from which the node is child of. nonetheless, it is highly advisable to include the entity since will help with the approach of your project. has an Id, a name and a display name. •New Diagram: This option will add a new blank diagram to the entity. 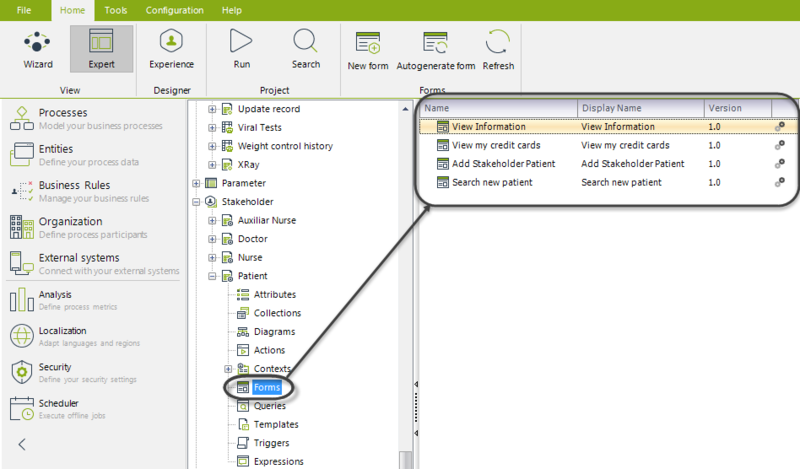 •Refresh: This option will reload the information stored from the database, refreshing the diagrams listed. The Actions node contains all the Actions defined for this entity. Hence, these actions can be executed selecting the entity in My Stuff section of the Me Menu, or executed from a Process. Every Action listed has a Display name, its operation (Form or Process), where can it be launched (whether Me menu or All Processes), the entity from which the current entity inherits from (if any), and if the Action is enabled. In case the Action is unchecked, the action will not be available for any Stakeholder. If the Action had been previously configured, the Draft icon is gray, otherwise is black. The Dply column shows if the Action has been launched to production (database icon) o if it is still in development (gear icon). •New Action: This option will start the Actions Advanced Configuration (learn more here) menu to add a new Action for the current entity. •Refresh: This option will reload the information stored from the database, refreshing the Actions listed. •New context: This option allows the user to create a new context for the current Stakeholder. When selected, the new Context window will be displayed. •Refresh: This option will reload the information stored from the database, refreshing the Contexts listed. •Actions: All actions defined for a context are listed in this node, regardless what the action does (whether start a process, open a form nor execute a rule). oNew Action: Allows the creation of a new Action directly related to the current Context. oRefresh: This option will reload the information stored from the database, refreshing the Actions listed. •Edit action: Starts the Advanced Actions Configuration menu with the information regarding the Action right-clicked. •Delete action: Deletes the Action right-clicked. •Copy to: Copies the action to be available in other Context of the same Stakeholder. •Move to: Move the action to be available in other Context of the same Stakeholder, making it unavailable in the current Context. 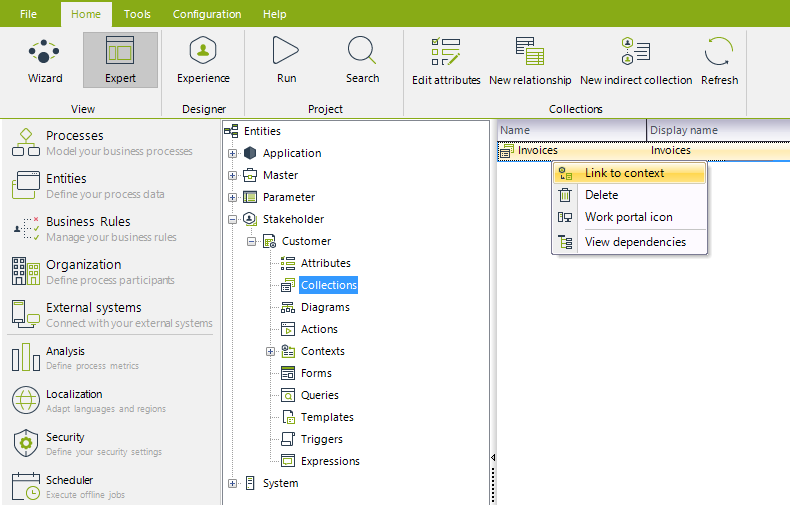 •View dependencies: List all the elements in Bizagi Studio which use the Action, in a hierarchy. When double-clicked, the Action starts the Advanced Actions Configuration menu with the information regarding the Action. •Suggested: All suggestions for the Stakeholder shown in the Relevant to me menu of the Work Portal are configured here. oNew Suggested: Allows the creation of a new suggestion directly related to the current Context. This suggestion will be shown in the Relevant to me menu of the Stakeholder. oRefresh: This option will reload the information stored from the database, refreshing the suggestions listed. Every suggestion listed is displayed with its Display name, the classification it has, the process attached to it. Since the suggestions are designed to start Processes, every suggestion has a Process attached to it and they can be grouped by a classification, only one classification can be chosen for each suggestion. •Edit suggested: Edit the current Suggested item. 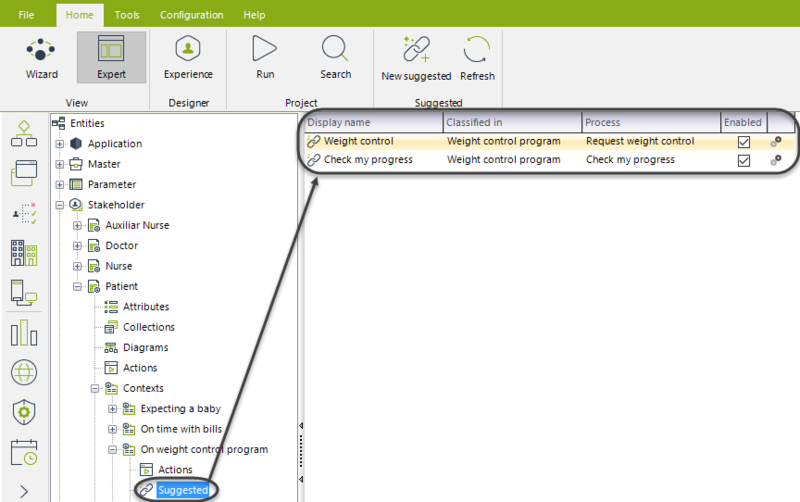 It opens the Suggested processes configuration window. •Delete: Deletes the current Suggested item. 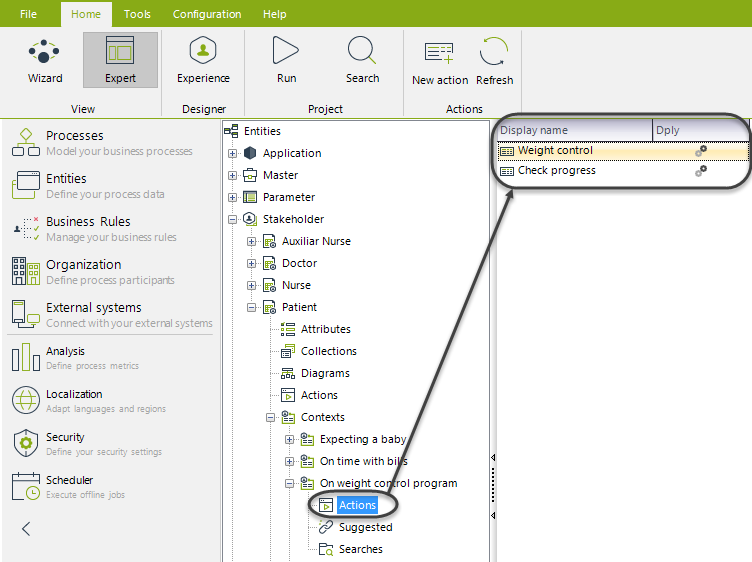 When double-clicked, the Suggested processes configuration window is started. •Searches: All defined searches for a Stakeholder in the Work Portal, regarding a context, can be configured through this node..
oNew Search: Allows the creation of a new search directly related to the current Context. This search will be shown in the search field of the Work Portal in the Stakeholders' session. oRefresh: This option will reload the information stored from the database, refreshing the searches listed. Every search listed is displayed with its Name, the entity to perform the search over, the form used to filter the search, and if the search is enabled to be used. •Edit search: Edit the current Search. 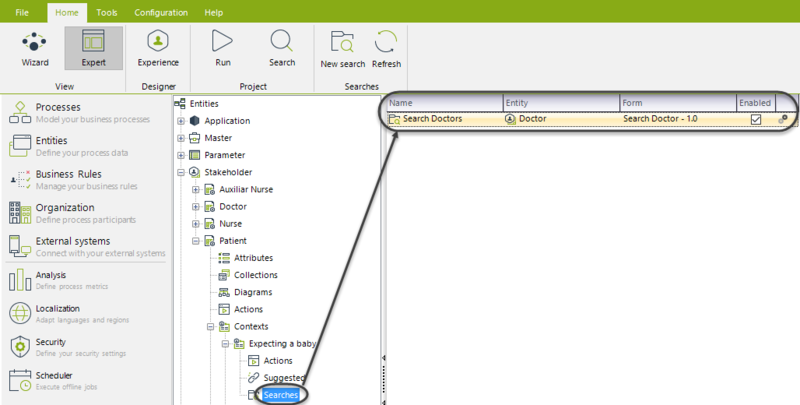 It opens the Search configuration window. •Delete search: Deletes the current Search item. •Copy to: Copies the Search to be available in other Contexts of the same Stakeholder. •Move to: Move the Search to be available in other Contexts of the same Stakeholder, making it unavailable in the current Context. •View dependencies: Displays in a hierarchy where is the Search being used. When double-clicked, the Search configuration window is started. The Forms node contains all the Forms defined for this entity. These forms are used in the Work Portal to interact with the final users. Every Form listed has a Name, a Display Name and version. 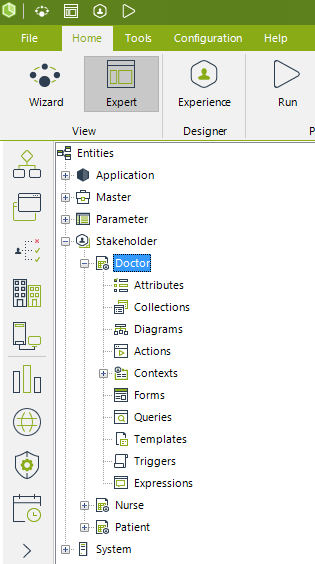 The Dply column shows if the Form has been launched to production (database icon) o if it is still in development (gear icon). •New Form: This option will start the Forms Editor (learn more here) window to add a new Form. •Autogenerate form: This option will automatically create a Form with all the current Stakeholder information. •Refresh: This option will reload the information stored from the database, refreshing the Forms listed. The Queries node contains all the queries defined for this entity. These queries are called Entity Query Forms they are used in the Work Portal to interact with the final users. To learn more, please refer to the Entity Query Forms article. Every query listed has a Display Name and its version. 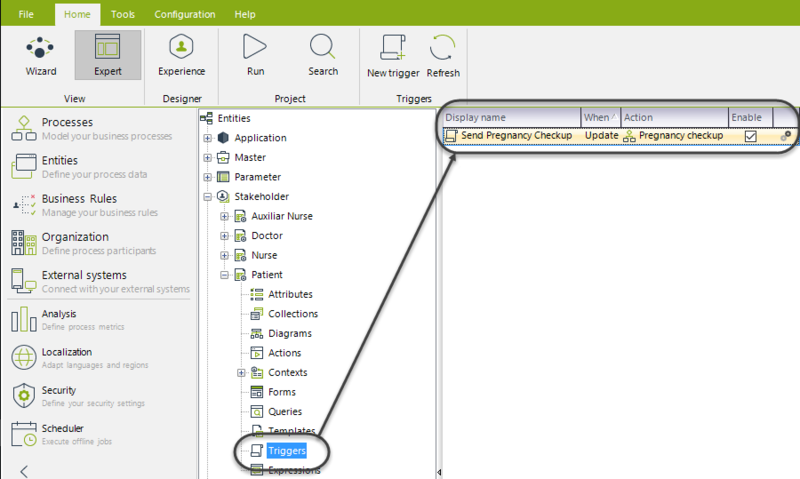 The Dply column shows if the query has been launched to production (database icon) o if it is still in development (gear icon). 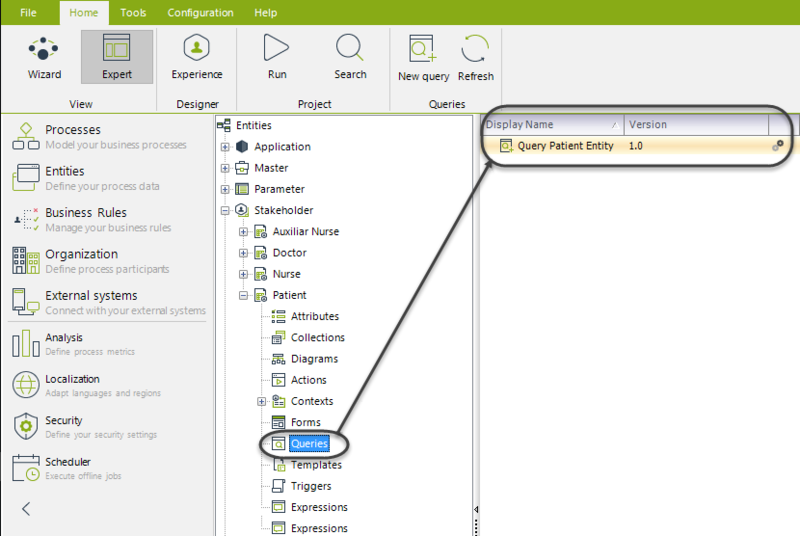 •New query: This option will start the Forms Editor (learn more here) window to add a Query Form. •Refresh: This option will reload the information stored from the database, refreshing the queries listed. The Templates node contains all the templates defined for this entity. These templates are used in the Work Portal to interact with the final users. To learn more, please refer to Data Templates. Every template listed has a display name, its defined type, to which Stakeholder does it applies for and where is the template able to be shown. The Enabled check allows the template to be displayed. The Dply column shows if the template has been launched to production (database icon) o if it is still in development (gear icon). •New template: This option will start the Template Configuration window (learn more here) to add a Data Template. •Refresh: This option will reload the information stored from the database, refreshing the templates listed. The Triggers node contains all the triggers defined for this entity. These triggers are data based actions. To learn more, please refer to Triggers. Every trigger listed has a display name, when will the trigger be launched, and the action to execute. The Enabled check allows the trigger to be used. The Dply column shows if the trigger has been launched to production (database icon) o if it is still in development (gear icon). •New trigger: This option will start the Trigger Configuration window (learn more here) to add a Trigger. •Refresh: This option will reload the information stored from the database, refreshing the triggers listed. •Edit trigger: This option starts the Trigger Configuration window, allowing the edition of the trigger. •Delete trigger: This option deletes the trigger as long as any related dependencies are found. •View dependencies: This option hierarchically lists all the dependencies of the trigger. The Expressions node contains all the expressions defined for this entity. To learn more, please refer to Expressions. Every expression listed has a name, and a display name. The Dply column shows if the expression has been launched to production (database icon) o if it is still in development (gear icon). •New expression: This option will start the Expression Configuration window to add a Expression. •Refresh: This option will reload the information stored from the database, refreshing the expressions listed. •Properties: This option starts the Expression Configuration window, allowing the edition of the expression. •Delete Rule: This option deletes the expression as long as any related dependencies are found. 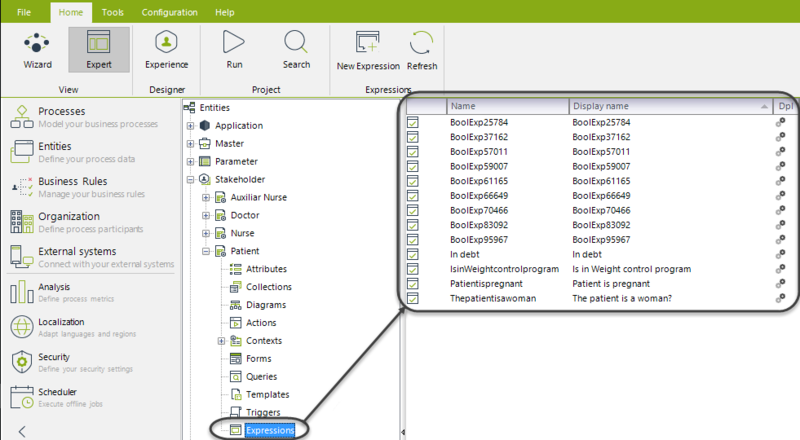 •View dependencies: This option hierarchically lists all the dependencies of the expression.